The Ram Promaster City Review: The Promaster City is Ram’s latest weapon in the delivery-van wars. Smaller than the full-size Promaster, it’s designed for commercial customers who do urban deliveries and value efficiency in their workday. I tested the new Promaster City Tradesman Cargo Van that is aimed at commercial customers who work in urban environments, with a compact size and emphasis on efficiency that seem perfect for businesses that want lots of capability for the buck. This van has lots of nice engineering upgrades that make life easier to live with in an everyday work van. Like a full length upper cargo tray with a catch net located right above the front windshield area to place maps, invoice books, personal items, laptops, cell phones, etc that are now out of sight, two large capacity drink holders in the front door panels and large map pockets, a set of 60/40 split opening rear doors with the larger door on the left side to make curb delivers easier, and finger release rear door hinges that fold the doors out at 180 degrees, allowing fork lift loading with 2 inches to spare on each side of the rear wheel wheels. Plus all the door handles are set straight up and down to grip easier and pull out and release the doors locks on the front doors, the side dual sliding doors and the rear full opening cargo doors. Small thing, yes, but these are all the little things that add up to make a day on the job easier, with less effort and wear and tear on the driver. Plus this van had the optional back up camera and rear parking sensors which all vehicles will have as standard equipment in a few years. Using a back up camera and parking sensors make life much safer too.Based on the Fiat Doblo, which has twice been named the International Van of the Year, this new compact van comes standard with a 2.4-liter Tigershark engine that delivers the best standard horsepower and torque in its class. What was tested? The 2015 Ram Promaster City Tradesman Cargo Van with a base price of $24,130. Options on the test van: An option package called the Tradesman Cargo Van Package 24C for -$1,000 that deletes the rear seats, all airbags and the side glass, the trailer tow group for $435, the Back-Up Camera group for $495, speed control for $225, the Cargo Partition solid wall package for $305, the Uconnect package for $465 and Sirius XM Satellite Radio for $195. The total MSRP price as tested including the $995 destination charge came to: $26,245. Why buy it? It has a surprisingly refined ride and comfortable cabin for a commercial vehicle. Driving it in traffic I thought it was the kind of van I could live with every day, not just only as a work van. 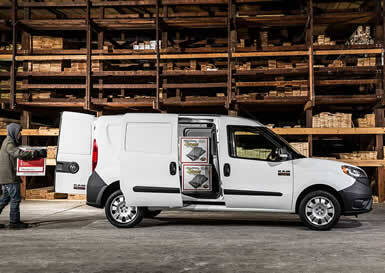 The Bottom Line: The 2015 Promaster City is Ram’s latest weapon in the delivery-van wars. Smaller than the full-size Promaster, it’s designed for commercial customers who do urban deliveries and value efficiency in their workday.